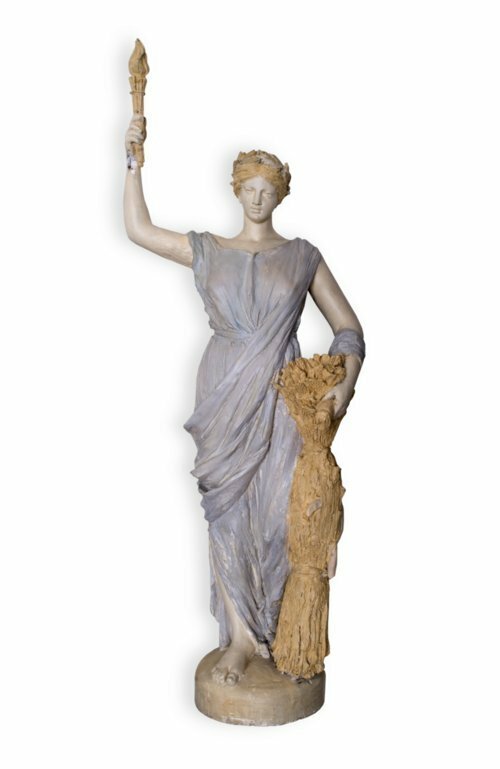 Blue and yellow painted plaster statue of Ceres, the Roman goddess of agriculture, intended for the dome of the Kansas statehouse. As the statehouse neared completion, officials considered a statue to adorn the dome cupola. In 1889, design proposals were solicited from artists. John H. Mahoney, an Indiana artist, was selected for his design of Ceres. Many felt the agricultural nature of Ceres was symbolic of Kansas; however, the project was deemed too expensive and tabled. In 1901, Attorney General Aretas Godard and State Architect John Stanton revived the project. Stanton approached the Winslow Brothers, a metalworking company in Chicago, with the Ceres design. The company hastily constructed this model for a bronze statue that was to measure 16 feet tall. State officials rejected the project again, citing the subject's pagan and promiscuous origin. For the next 70 years the model was stored in statehouse closets and was periodically displayed in times of renewed interest in the dome statue project. Finally, the Ceres proposal was permanently rejected when a bronze statue of a Kaw Indian named Ad Astra was installed on the dome in 2002.